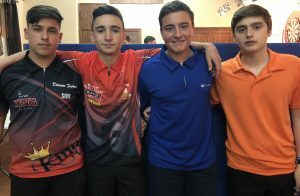 A total of 15 youngsters participated in the Fifth Youth Ranking event of the season, which took place on Wednesday 21st March. This event is the penultimate ranked event of the youth season, the final event will be the National Champion which takes place on the 21st April. 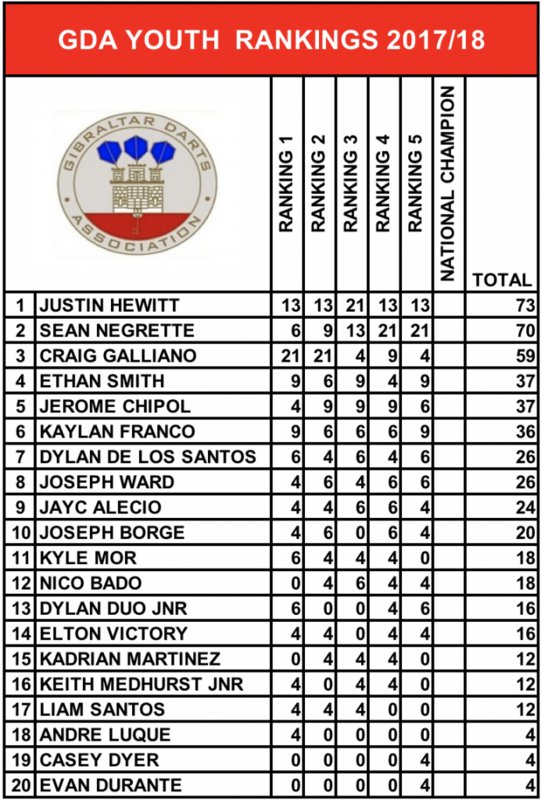 Sean Negrette managed to get the better over Justin Hewitt once again to claim his second ranking event in a row, this now means Sean has achieved enough points to qualify for the 2018 European Youth Squad, he joins Craig Galliano and Justin Hewitt who are already qualified. The final spot will be decided in the last and final event and the three players who are in contention for the fourth spot are Ethan Smith, Jerome Chipol and Kaylan Franco. It will be a very nervy day for these boys, as only one will qualify. It is very likely that the fourth and fifth placed players could end up with the exact same points, if this is the case a playoff game will be played after the event to determine who qualifies. In the first round we saw comfortable 3-0 victories for Dylan Duo Jnr against Nico Bado in the battle of the youngsters, Dylan De Los Santos over newcomer Casey Dyer, Sean Negrette against Jayc Alecio and Jerome Chipol against Elton Victory. Other results saw Kaylan Franco defeat youngster Joseph Borge 3-1 and Joseph Ward defeat newcomer Evan Durante 3-1. The stand out game from the first round was Justin Hewitt against Craig Galliano, Craig managed to get into a 2-0 lead in the game but Justin fought back and managed to overturn the game and won 3 legs in a row to win the game 3-2. In the Quarter-Final’s Ethan Smith managed to defeat youngster Dylan Duo Jnr 3-0, Sean Negrette defeated Dylan De Los Santos 3-0 and Justin Hewitt defeated Joseph Ward by the same scoreline 3-0. In the final Quarter-Final match Kaylan Franco managed to defeat Jerome Chipol in what was a very tight match 3-2. In the first Semi-Final match Sean Negrette managed to defeat the number one seed Ethan Smith with relative ease. Sean’s high scoring was too much for Ethan to handle as he won the game in straight legs 3-0. The second Semi-Final game was a much tighter affair. Kaylan Franco who has been playing some great darts recently pushed Justin to a last leg decider, both players had the chance to win the game but it was Justin who held his nerve to book his place in the final with a 3-2 win. The pair have faced each other in three consecutive finals and before today they had each won one tie each, but today it was Sean’s day once again, just like in the previous final his scoring and quick double hitting was too much for Justin to handle as he won the game 4-1. Sean won the bull and started the game. Leg 1 – Sean manages to hold his throw by hitting D8 to lead 1-0. Leg 2 – Justin manages to hold his throw by hitting D1 to level the game 1-1. Leg 3 – Sean holds his throw with a 51 checkout on D16 to re take the lead 2-1. Leg 4 – Sean manages to break the throw and extended his lead by hitting D10, 3-1. Leg 5 – Sean hits D16 to win the game 4-1 and take the title. Congratulations to Sean Negrette, commiserations to Justin Hewitt! Jeremy Cruz caught up with the winner Sean Negrette after the final..
Sean, back to back Ranking wins, only a few players have managed to win two ranking events in a row in the past years, this must be a great achievement for you? You defeated Justin Hewitt in the final for the second consecutive time and you only managed to drop one leg throughout the event, that was against Justin in the final, you must be really happy with the way you are performing at the moment? This victory puts you second in the current ranking table, but most importantly it means you have now gained enough points to qualify for this years European Youth Cup, this must be great news for you? There is one event remaining to finish off the season, the National Champion event. Undoubtedly the most important event of the season, you must feel very confident going into this event? Just recently the 2017 European Squad received the award for best local junior team in Gibraltar, this must have been a proud moment for you and for the rest of the team? And Finally Sean, there are three players fighting for the fourth spot. It will be decided in the National Champion event who gets the final place in the squad. Personally, who do you think will handle the pressure more and qualify? Below is the updated Ranking Table..